YourKit Java Profiler Help - Start CPU profiling. Sampling, tracing, call counting. To begin obtaining profiling results, start CPU measuring when your application requires it. When sampling is used, the profiler periodically queries stacks of running threads to estimate the slowest parts of the code. No method invocation counts are available, only CPU time. Sampling is typically the best option when your goal is to locate and discover performance bottlenecks. With sampling, the profiler adds virtually no overhead to the profiled application. However, the probes for the high-level statistics, if enabled, may impose additional overhead. You can configure some CPU sampling aspects with CPU sampling settings. When tracing is used, the profiler instruments the bytecode of the profiled application for recording thread CPU time spent inside each profiled method. Both times and invocation counts are available. Although tracing provides more information, it has its drawbacks. First, it may noticeably slow down the profiled application, because the profiler executes special code on each enter to and exit from the methods being profiled. The greater the number of method invocations in the profiled application, the lower its speed when tracing is turned on. The second drawback is that, since this mode affects the execution speed of the profiled application, the CPU times recorded in this mode may be less adequate than times recorded with sampling. Please use this mode only if you really need method invocation counts. To control profiling overhead and accuracy of the results use CPU tracing settings. Also, the probes for the high-level statistics, if enabled, may impose additional overhead. Call counting is the most lightweight CPU profiling mode. It's a simple tool for identifying potential performance problems caused by suboptimal algorithms. The approach is based on assumption that method(s) with a big number of invocations may indicate a performance problem. It provides a plain method list with method invocation counts. Unlike other CPU profiling modes it does not provide stack traces nor method times. Method invocations from different threads are summed and cannot be distinguished. Counts are not guaranteed to be exact. To ensure minimal overhead invocation counts are updated without taking any locks or using test-and-set style atomic operations. If the same method is simultaneously called in different threads running in parallel on different CPU cores, some of its invocations may be missed by a non-atomic counter. Fortunately, the probability of such events is low, and missed invocations, if any, will normally constitute only a small fraction of all invocations. The probes in Auto activity mode are not activated in call counting, thus high-level statistics is not collected. Use call counting to initially detect possible problems: thanks to its low overhead you may do this even in production. Further investigation may involve using CPU tracing or sampling to get comprehensive profiling results including times and stack traces (call tree). Please note that CPU tracing and call counting are based on bytecode instrumentation. If the startup options disabletracing or disableall are specified, it will be disabled, making CPU sampling the only available mode. When CPU profiling is started, the results are immediately available in "Call tree" (with threads merged) and "Method list" tabs. In case of CPU tracing, both method times and invocation counts are shown. In case of CPU sampling, only times are shown. The live view provides only basic information. 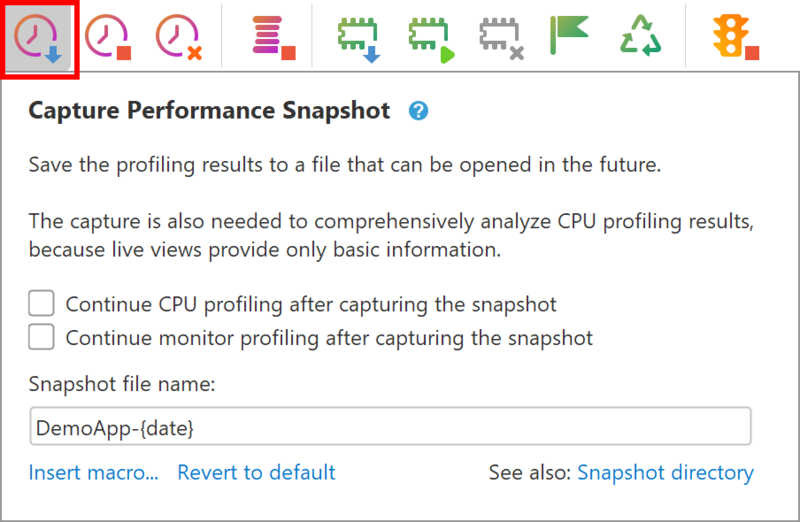 To perform comprehensive analysis, capture performance snapshot, open it and use the full featured CPU view. When the task you intended to profile has finished (or has performed for a sufficient amount of time), capture a performance snapshot with all the recorded information. When this is done from the profiler UI, you can open the results for immediate analysis. 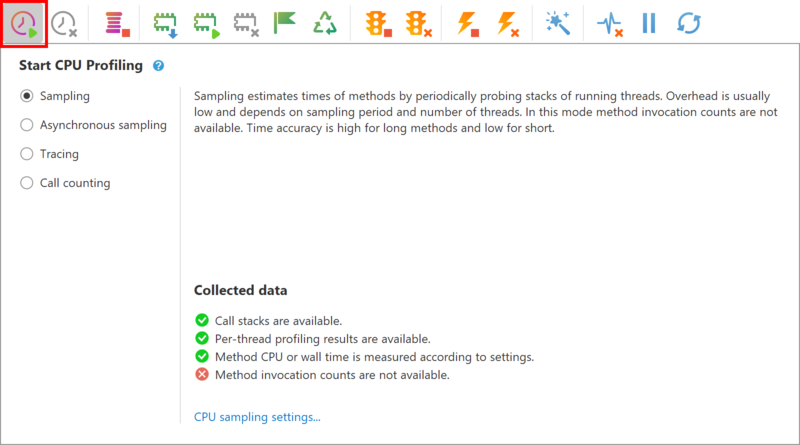 Further topics in this section describe the profiler's UI for analyzing CPU profiling results. You can start and stop CPU profiling during the execution of your application as many times as you want. When CPU profiling is not running, the profiler adds no performance overhead to application being profiled. In some cases, it also may be useful to launch the application with CPU profiling already started and/or automatically capture performance snapshot on exit of the profiled application (see Startup options). CPU profiling can be performed programmatically with the help of the Profiler API.